Well now, this is awkward. 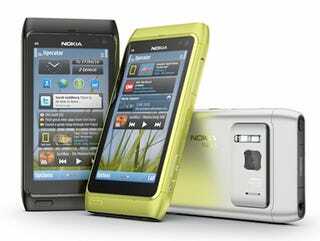 Only yesterday Mobile-Review was calling the N8 an unpolished turd, and now Nokia's gone and announced it to the world. As leaks foretold, it's got a 12MP camera with Xenon flash, and runs Symbian^3. It's Nokia's first Symbian^3 phone, and while initial videos and photos made it look pretty special indeed, Mobile-Review's early look at it warranted a big, fat "do not like." As I said yesterday, that could be because it was an early prototype—time will tell, in any case. Onto the specs, and that camera has Carl Zeiss optics and the Xenon flash most Nokias are blessed with. It can record video in 720p and thanks to the HDMI output, can play footage on HDTVs. The screen is a 3.5-inch capacitive touchscreen, and there's 16GB of inbuilt storage, expandable up to 48GB if you've got the requisite microSD memory card. As with all the next-gen Nokia handsets, free Ovi Maps is included. UPDATE: Full list of specs here.